Time for some QSM11 education. As you read thru the below, always associate or think this—It’s 20 HP per gallon per hour—example = burn 17.5 GPH = 350 HP that is being asked from the engine – and that is not RPM dependent. So at a full load of 580 HP, the engine would burn about 29-30 GPH. 1) The base engine was developed in the mid-90’s and really came from the L10 (late 80’s thru mid-90’s). It was a 100% solid truck platform FROM DAY ONE………. 2) First “marinized” version was released in 1999 in both 635HP and 580HP (both 2300 rated RPM) versions. Seaboard sold and installed the 1st set on the West Coast and put them in the APOLLO out of San Diego in the Spring of 2000. I tracked those engines until J.J. sold the vessel about 8 years ago and, at that time they were well over 50,000 hours each (no rebuilds at that time) – Very solid engine – he ran easy (maybe averaged 10-12 GPH per engine cruising at 10-11K’s). 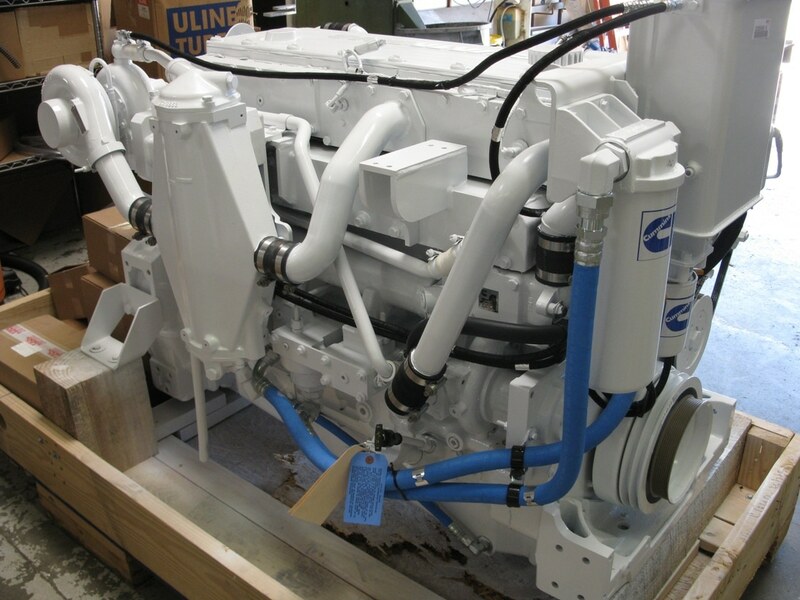 3) In our personal opinion, the initial marinization (and IMO, current marinization) of the engine proved to be very weak—Cummins engineers decided for ??? reasons (cost, emissions, weight, compactness, time to develop, “perceived efficiency”, etc, etc.) 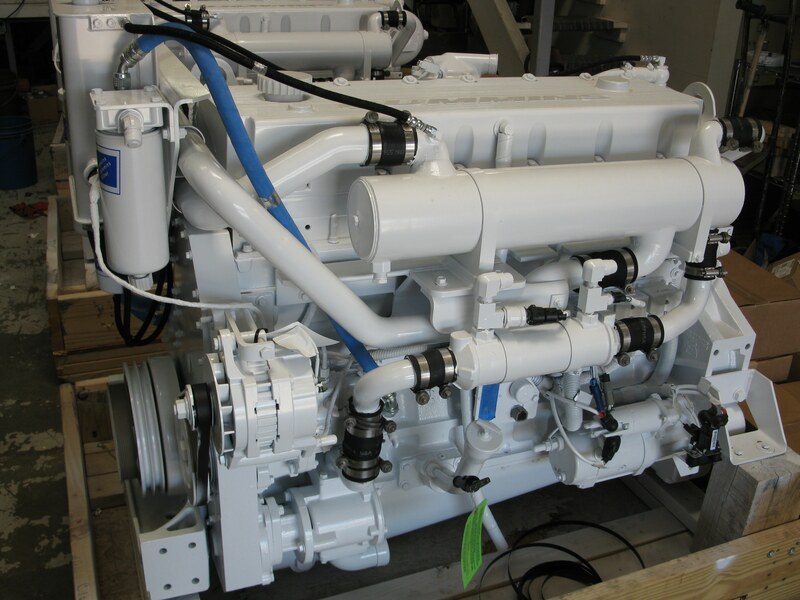 to keep the dry truck manifold and dry turbo and IMO, was a very poor choice….. J.J.’s engine did not even make 500 hours before we had to warranty the manifolds. HENCE, the DRY QSM was born and I gave it that name and has stayed with it until today. 4) Within a year or so, Cummins released some new HP ratings for the engine—350 at 1800 RPM, & 400, 450 (at a 2100 RPM rating) and 535 at 2300 RPM. Still setup as “DRY” versions and all suffered the same issues (warped manifolds, broken exhaust studs, warped or cracked turbo bases, etc) but to a much lesser degree as the MAX HP was less. Some engines would survive for a few 1000 hours before they had an issue, yet others would not make 500 hours before exhaust “leaks” were present. It basically came down to How much HP you extracted from the engine at CRUISE……… If you traveled at or above 16-17GPH and you did it at RPMs less than 1800, then you were going to have problems. Travel at 17GPH at 2000 or above and the manifolds held up pretty good. So two things became apparent over the years: One was the engine could make the power, but the manifold & turbo did not hold up at higher loads. And if you needed to pull 400HP from the engine for cruising, better prop the engine to do it at RPM’s above 2100 if you want any service from those parts. BTW, to this day it’s all the same, but maybe worse as the 670 version really wears them out fast, especially the manifolds. Go to some other forums and type “DRY QSM” or “QSM11 manifold leaks”. 5) Enter the “WET QSM 11” (Another term I made up and has stuck to today) ——————Sometime about 2005 Cummins released a WET version of the QSM11—It came from the generator group and overall was engineered very well—Or should I say, “reverse engineered”.. What that team of engineers did was take “off the shelf” components (the 6CTA 8.3 450 Diamond aftercooler and heat exchanger—both proven components) and built a well engineered wet exhaust manifold, and adapted those components to the QSM 11.. IMO, they did a 99% job (I can always find room for improvement) ..The engine met EPA Tier 2 specs and had HP ratings of 350 @ 1800 (right from the generator rating), 400 and 450 at 2100 RPM………….IMO, that engine turned out to be the best marine engine Cummins had released to date in that size range………………………Installed a bunch and one pair is in SD now (Ventura II—close to a 200 ton fishing vessel) and I’m sure it is over 50,000 hrs — ROCK Solid. 6) Fast forward to about 2013-ish————As the population grew and “super good feedback” continued, a “Black Eye” suddenly popped up about 5 years ago. 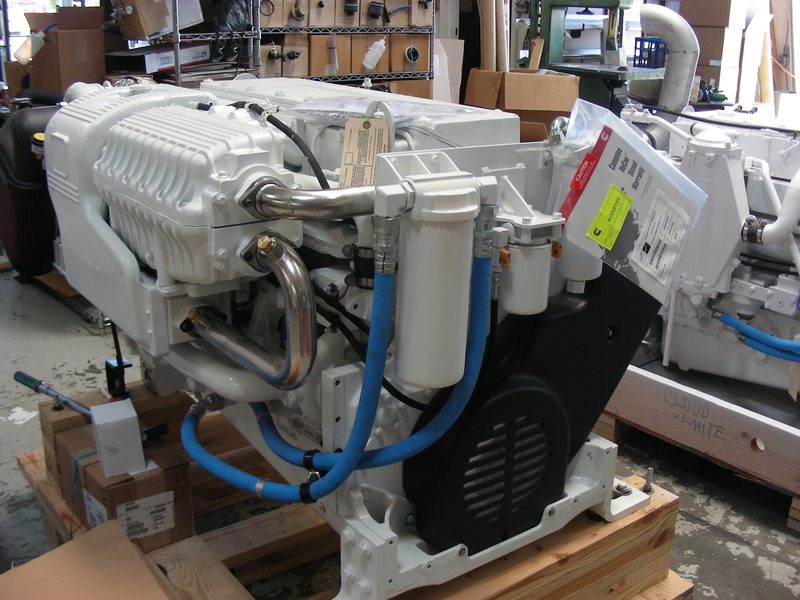 I had installed about 10 of these engines in the Long Beach and San Diego area over a 2 year period. All of a sudden, engines were “dropping valves” in the 2000-4000 hours range. Fingers started pointing immediately (bad install — “Tony did something” (I was a common denominator at that time), lack of maintenance, etc etc etc)…………. Over the next & very difficult 6-8 months, all sorts of testing went on to figure out what is was—The Cummins factory were working on it too, but kept very quiet—In fact, during the interim “finger pointing period,” they re-wrote the oil change interval to less than 50% of before (only the Marine version—not the truck engine). To me that said one thing—The marine engines were being built in a different location and there was QC “oil lubrication” issue—Of course nothing was said—Also during this period, other QSM 11 engines from this general production period popped (same valve issue) in other areas of the country (that took me out of the equation)………………Then, maybe after 2 yrs or so, all of the issues disappeared and the oil change interval went back to normal…. This is what I feel happened—The oil feed to the top end was at less than 50% of normal caused by improper cam bearing assembly that would block the oil flow to the overhead valve gear.. This caused the rocker arm pads to wear very quickly and then they hit the valve keepers. The keepers would pop out, and the rest was history—Lots of in-house documentation on this…………But long story short, other than this one glitch, the engine is back in favor with me as a True Marine Commercial Heavy Duty 11L engine that IMO, will never wear out in a 1000 hour a year application. Plus the electronics are 100% and have never needed any upgrades—Today this engine is EPA Tier 3 and last year was released at 400HP, 100% continuous duty at 1800 RPM. That is a serious rating for an 11L engine, and proves without any doubt that Cummins is proud of the “internals” that are really the basics of the engine…..
7) Let’s take a look at the T3 QSM11 rated at 450 HP / 2100 RPM…. Set up right, they can burn 20 GPH making 400HP 24-7-365 and never look back.. You’ll have an extra 50 HP per engine that you can use to 2-3 hours at a time, and again, the engine will never have a hiccup…Run hard 50-60% of the time, and you’ll see 20,000+ hours out of this engine before a top-end.. It will run easy at 30% duty cycle (meaning cruising at 12K or less), and you’ll go 70,000 hours + before top end…So there it is.. Now you know all about this engine. Just so you know, the QSL9 rated at 450 HP 2100 RPM (medium continuous duty) would also do an operator right in a similar application, and would be lighter, quieter, smoother, and less expensive to buy & maintain. 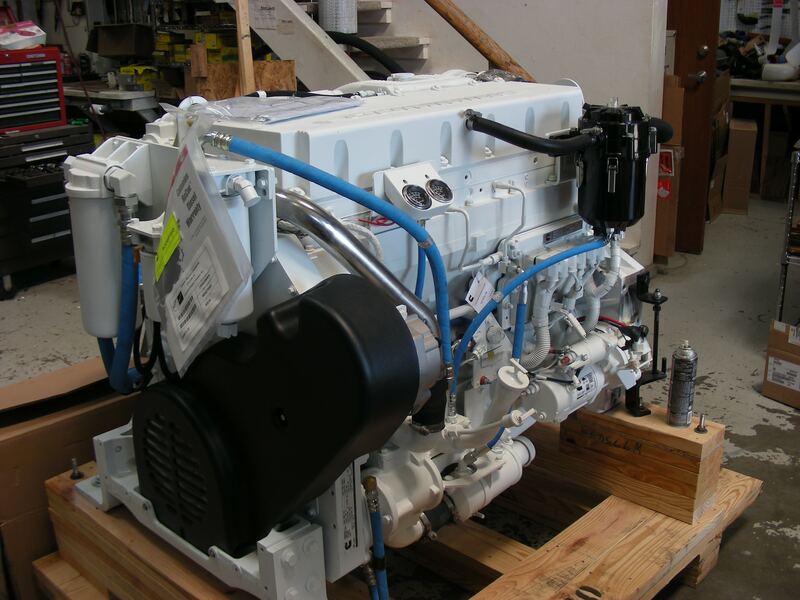 Another really great engine for high hour commercial applications that I think is in a class of its own. But neither of these engines will give you the “Show & Tell” day “speeds” like you would get with the 715 Version.. Also, of “worthy mention”—100% of all the internal parts ( the “guts” so to say) of any of these versions (cranks, bearings, pistons, rods, seals, heads, valve gears, etc etc etc etc) are identical—Only the engine’s “hang-ons” and ECM coding are different.